He had a facial disfigurement when his plane was shot down and after convalescence he was visited and offered a desk job, which was not him at all. They noticed diving certificates from when he was younger on his wall and suggested that was the way to go. So he did and one of his jobs was to dive under at Loch Ness. He told me when I was six. He took a job with the Pru when older and told me because I was looking at my kids encyclopaedia at the time and he'd come to collect mum's money on her insurance. He told me casually about his encounter as I was looking at a dino picture at the time. He said he was told to go down beside a wall and had lights with him. He said while he was working he noticed something was moving above him. Thinking it was the boat he'd dived from he looked up and his goggles were filled with something just above his head, he realised it was a huge animal. He said he froze and waited for it to move again and when it floated on, he started to surface as fast as he could shining a light downwards to see what it was. He said he saw the Loch Ness Monster, the classic plesiosaur shape was described and how it moved with his hand, which I can remember. He was a quiet religious man who never drew attention to himself, especially because of how he looked he preferred to melt into the background. He was very sincere with what he told, so I have no reason to disbelieve what he told me and for him, I would like to see whatever it is discovered. So concludes a story we can add to the experiences of Robert Badger, James Honeyman, Duncan MacDonald, Beppo the Clown (see Badger case) and doubtless a few others as well. It is the rarest of Nessie encounters and I would wager the most unsettling when one considers you are in the monster's domain with little avenue for escape (though no casualties have ever been disclosed). Actually, when I read the story and how the diver had gone "down beside a wall", I wondered if he was part of the diving team that were involved in the search for the body of Mrs. Hambro, who drowned in an accident at Loch Ness in 1932? I thought the wall could be the sheer drop that occurs at the Horseshoe Scree, where the accident happened. However, this event seems to have happened in the 1940s and was perhaps training at the loch for wartime operations. Did he report the event to his superiors or keep it to himself? An FOI request on wartime operations at Loch Ness would be an interesting exercise, though perhaps ultimately unfruitful. It was also mentioned that her diver friend said the closest picture he had seen to it was a sea monster called a "Tomberino" or something like that. Off the top of my head, I don't know what that may refer to, but if anyone knows, leave a comment here. Excellent report with no hint of exaggeration. I do think a freedom of information request might turn up some interesting stories, unless they've been buried. Surely any visible incident involving a Nessie would have to be reported. I'm wondering too, given military level optics (which were excellent back then) if there are any decent photos stored away? This following story is a link from the above one and is of the 12 yr old girl referenced on the Aug. 21 blog article Loch Ness Monster Sighting Last Week? I know, I know, off topic from diver article, but I just wanted to make sure everyone got a chance to see it as they may be done with the Aug 21 article and not revisit there. John, that YouTube video is awful in my opinion. There are more clips of faked images and the model Nessie near the boat than there are of the girl’s photo. The video drags on forever, repeating itself many times. Plus there’s the awful music which doesn’t go with the subject matter at all. Thank you for digging stuff out though John, I just don’t like that particular video. More than 50 years ago I read a popular article entitled, "He fought the horror of Loch Ness". It told of a diver who found himself under a dark shape, and a short, thick, flexible appendage wrapped around one of his legs. As the creature was dragging him further out and deeper, he managed to release the appendage and escape. I also think there is an element of truth in these stories, although not necessarily as much as we would like. Hard to think of a real underwater wall in Loch Ness, maybe a canal lock wall or the old railway pier terminus. The Hambro incident is out of time if we are thinking of a WW2 veteran, although many airmen were disfigured in WW1 and that would fit with the attempted recovery of Mrs. Hambro in 1932. The first open air circuit or scuba systems were invented by Jacques-Yves Cousteau and Emile Gagnan in 1942/1943. Before that, such as the 1930s, divers would used the large bulky helmet type diving suits breathing compressed air supplied from the surface with a hose. Since the teller of the tale references his goggles, it seems to me that he is talking about a scuba type mask that would have been in wide use after WW II. I admire anyone who goes diving in loch ness.I know some divers have described it as a black hole.It must be pretty scary. Nicely written account. But again, without real names attached it means very little. We don't even know if the guy existed let alone whether he's telling the truth. I know the teller of the story well enough to trust she told me the account as best she could remember it. I don't have a reason to doubt the man existed, whether you believe him or not is obviously a more loaded question as it involves an experience beyond the "normal". I think people's reactions can end up giving away the truth of the matter, on many occasions. Whatever Robert Badger encountered clearly shook him. For divers in Loch Ness, this is an occupational hazard, so I do wonder a little bit why it was so much of a shock. Maybe he was never expecting this encounter to take place. Although the creature has stirred emotion in those who see it, and over many years we can read the same type of stories again and again. The mind is a funny thing, and it seems to get a bit funnier when faced with something that should not be there. We swam from The Clansman to Dores last year and after only a short time in the water (couple hundred metres max) I swam over what on reflection was clearly a salmon. It freaked me right out at the time. I made the rest of the crossing like Michael Phelps. It likely wouldn’t have registered in any other body of water. It’s all about the context. How big was the salmon? RP McMurphy, of course you’ll understand that your reaction to a salmon has no bearing on the validity of this story. There’s no connection other than the fact that so many sightings of large animals in Loch Ness have made you a bit sensitive when swimming there. There was a lamberino, or lambasauro cryptid in Italy I think, in the 40s,so time is right anyway. I think the one your thinking of is Lariosauro. It was sighted in the 1940's in lake Como, just after the war I think. There have been one or two later sightings and Como is another very deep lake, over 400m at its deepest spot. 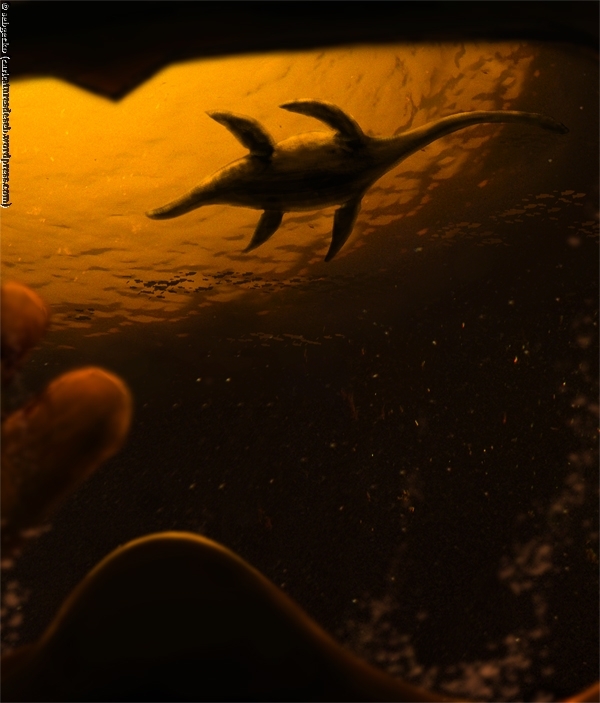 It was described as a Plesiosaur looking animal but the later descriptions of it vary to some extent. Not so big. It was more the fact that in many years of swimming in the Loch it was the first living thing I’ve ever seen in there under the water (aside from other swimmers). Plus the fact it was clearly a few feet below me. Contrary to popular belief, visibility in the Loch is actually pretty good in the first 10-20 metres.